Intelligent index and search capabilities present in Zerto 7 will be one of the key points when used in conjunction with the Zerto Elastic Journal for backup and recovery. Zerto 7 software is scheduled for release in Q1 2019. In this post, we'll talk about Zerto 7 Intelligent Index and Search Capabilities, but also about Zerto Elastic Journal which is one of the key elements of the new platform. As we have already reported, Zerto 7 is currently in development, and the software vendor preparing the release for Q1 2019. We already know that there will be a new Elastic Journal composed of short-term retention (seconds) and long-term retentions. The short-term journal will be located on-site for fast restores where long-term retention will be located in a more cost-effective storage. For the long-term retention, there will be many options, many storage targets, which will be supported. Here are the principal ones: NFS, SMB, S3, HPE StoreOnce, Azure, AWS. Zerto technology for data protection is different than used elsewhere. Zerto’s Virtual Replication Appliance (VRA) is able to tap into a virtual machine’s IO stream causing no overhead or performance problems compared to traditional hypervisor snapshots that other backup vendors are leveraging. It captures and copies the IOs from a particular VM to the remote site where a journal system keeps those data sorted for 30 days right now at maximum. And why suddenly Zerto will be able to compete with traditional backup vendors? It's because of longer retention periods. Usually, as an IT admin, you have the duty to keep the backups for recovery and legal purposes, for several years. And the idea here with Zerto Elastic Journal is to keep those data during a longer period of time to provide the ability to recover VMs, files or application at any period of time, somewhere from 7s to 7years. Perhaps even longer. The importance of the Elastic Journal is obvious as you'll be able to revert your VMs back in time, at any of the restore points present within the journal. And you won't be limited to 30 days only. As such, the workloads will be recoverable, files will be recoverable, for several years back. And this is something that Zerto currently does not do. By adding this, Zerto will no longer be considered as a DR and replication vendor, but also as a backup vendor. Zerto 7 will also have different UI which will feature more streamlined workflows for recovery. And here is another image showing the short-term and long-term retention journal. The idea is to have a single journal to search, but another repository for the long-term retention. How about the Intelligent Index and Search Capabilities? Well, this is something to check when the software will really be available for testing. But what's known is that you'll be able to search through the journal. And in fact, your users themselves will also be able to restore their files which need, through the UI. Please note that this screenshot is from a preview version of Zerto and that the final release might look differently. You'll be searching through the journal across all targets > select a checkpoint > then recover. 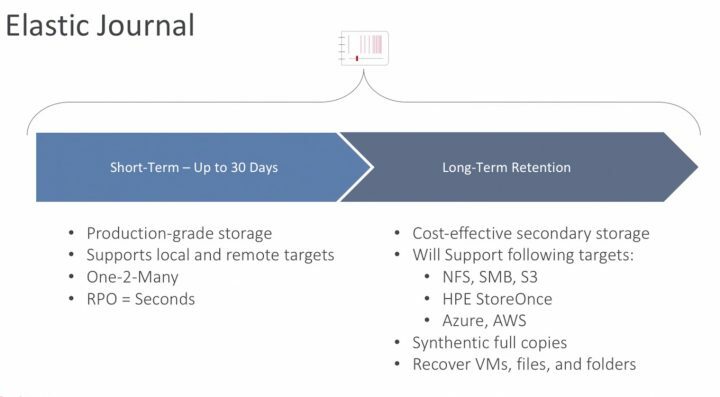 I think that the Zerto 7 will be adding a very interesting feature with this release, car long-term retention for recovery of files or VMs is necessary for any enterprise, SMB or very large customer. By providing this Zerto is certainly willing to compete with other vendors in the data protection space. Time will tell if this strategy will succeed or other features are necessary as well. We can think of an application-aware recovery such as MS Exchange DB, e-mail, or SQL, might be needed as well. Even though there are external tools (not integrated with Zerto) which might be used for such situations. Zerto is a powerful DR solution which is simple to set up, test and use. You can also use Zerto to migrate our VMs between data centers and cloud providers. What is a Zerto Elastic Journal?